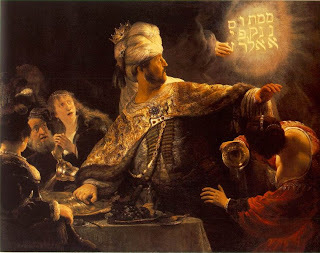 Bishop Alan’s Blog: Is it the Sun wot will win it? Is it the Sun wot will win it? Brown doomed. Official. The Sun has decided to support the Conservatives for the next election. 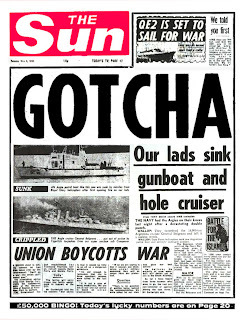 For overseas readers, the Sun is a British end-of-the-pier newpaper that can be good fun and surprisingly cleverly written, the front page of which occasionally captures a national mood crudely but effectively. It has a capacity to annoy all sorts of people, but can be immensely entertaining, if rather right wing, sexist, and celebrity-obsessed. Much wry comment could be made about the Sun. Some say it’s only what most other UK newspapers except the Financial Times really are, but they are far too snobbish to take responsibility for being as crude and vulgar. The Sun is generally good natured. It also seems to believe its readers are people who don’t think for themselves and will therefore follow its advice, sheeplike, about how to vote. As much as I’d like this not to be the case, it may be right. Like the rest of Fleet Street, it probably overclaims its readership in order to prop up its dwindling advertising income, but they all do, and business is business. So come in, Gordon Brown, your time is up. A brave face was put on this yesterday by Labour politicians, of course, but according to conventional wisdom the writing is now on the wall. I’m not sure, myself, that the Sun does win or lose elections. 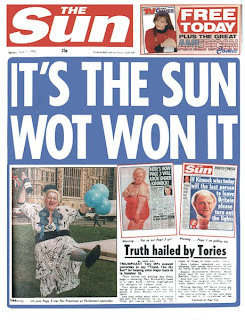 The Sun, historically speaking, trims its views pragmatically to match whoever it thinks will win. I suspect it follows as much as leads public opinion. And, of course, in these days of collapsing newsprint, it will be interesting to see exactly which part of fractured public opinion it follows. My hunch, for the little it’s worth, is that the age profile of people who actually vote could be weighted towards elderly. I rather doubt the Labour party has the will or the wherewithal to connect with voters under 30, so the election may well be decided by the kind of people who still read the Sun. I wouldn’t be so sure about the 2015 election. On the day the value of UK advertising on the internet overtook the value of TV advertising, it may be the writing is also on the wall for the Sun. Could Gordon Brown thus get the last laugh after all, but too late to save his government? The Sun read the public mood, it didn't change it - and the media landscape is very different now. I suspect Labour will have studied Obama's Internet driven campaign with close attention. Public opinion is no longer determined by the commentators. Recent statements from James Murdoch about the BBC have exploded any pretence by the Murdoch empire to have a disinterested view of the election. Floating voters interviewed at the end of the Labour conference on Newsnight almost all said they could not vote for Cameron, and both my sons have recently warmed to Brown. And the economy is allegedly going to start recovering before the election. None of this means that Labour will win, but they can't be written off just because the Sun is suffering from premature declaration! I have no idea why Mr. Brown stated in his reaction that 'newspapers' do not win elections. 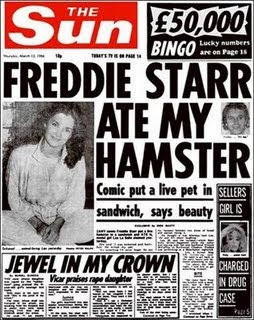 The Sun, is not a newspaper (it's a tabloid rag). So why insinuate as much Mr. Brown? Pam, I really hope you're right. I agree strongly about James Murdoch's laughable comments about the BBC — all it proves is that Murdoch loves his own dominant position well enough, and resents bitterly the fact his empire just can't match a public entity like the BBC on quality. On a values level I'm sure the appeal of Fleet Street right wing politics is very limited, but under 40's will have to get out there and vote. So, with some anxiety, I hope you're right, and would be very pleased if we could prove to the press barons that we can think for ourselves. Pstyle, I wonder if tearing up a copy at the party conference was rather validating the Sun's line in a backhand kind of way. Hope not.